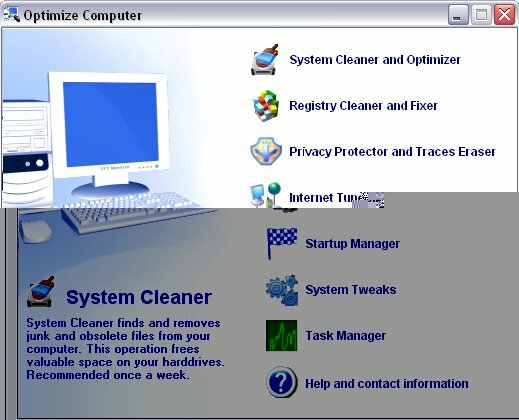 Optimize Computer - Keep your PC running faster, cleaner, and error free. Optimize Computer is a award winning application is a suite of 7 powerful tools designed to increase the performance of your computer, by correcting problems, cleaning and fixing Windows registry, deleting unnecessary files, fine-tuning your internet connection settings, shredding the unwanted files like cookies, internet history and temporary files and more. ...... old and unused files to free up drive space and to speed up your computer. Seek files such as temporary Internet files, redundant shortcuts, installation files and old backup files; destroy these useless files and watch your PC speed increase. * Registry Cleaner and Fixer: easily optimize your PC's registry by fixing errors, deleting unused registry entries and removing hard drive fragmentation to allow your PC to process data more quickly. * Privacy Protector and Traces Eraser: delete evidence of your Internet surfing and keep your Internet files optimized and your online privacy secure. Internet Tuner: include 11 features to get the most out of your net connection. Internet Tuner will automatically adjust settings to ensure you surf as fast as possible! Optimize your flash file with no lose of flash file quality. Qweas is providing links to Optimize Computer 1.4 as a courtesy, and makes no representations regarding Optimize Computer or any other applications or any information related thereto. Any questions, complaints or claims regarding this application Optimize Computer 1.4 must be directed to the appropriate software vendor. You may click the publisher link of Optimize Computer on the top of this page to get more details about the vendor.